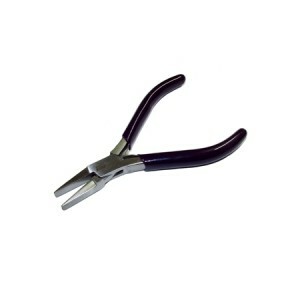 Half Round / Flat Bending Pliers 130mm The BEADSMITH. This pliers has two types of jaw, half-round a..
HI-TECH Leather of soft metal ( up to 0.5mm ) Hole Punch with Spring The BEADSMITH 145mm, 1.5m.. PERFECT LOOPER Round / Chain Nose Pliers w/ 3 grooves 125mm The BEADSMITH. Makes identical loops eve..
*** NEW & IMPROVED TOOL KITS! *** SOLDERING "EXTENSION" FOR TOOL KIT A set of jewellery to..
STARTER TOOL KIT A set of jewellery making tools great for those just starting out, packaged in a ..
STUDENT TOOL KIT A set of jewellery making tools great for those on a jewellery college course, pa..